I'm so excited because I finally get to meet IN PERSON, a stamper whose work I have admired for quite a while. 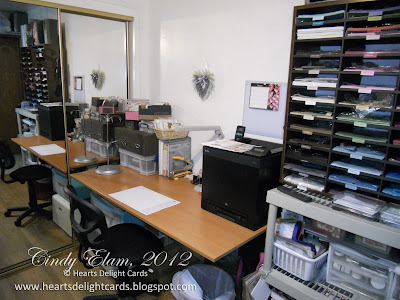 Jennifer Timko of Stampin' on the Fly is a pilot (hence her blog name) and sister Stampin' Addict, and has a layover here in San Diego, so we get to play in my little stamp cave! SQUEEEEE! In addition to her classy cards, she makes the most amazing bows, and is going to show me how she works her voodoo over ribbon that frequently refuses to cooperate for me. 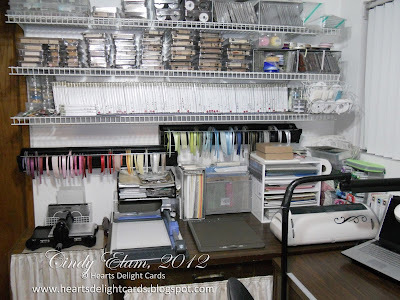 Of course, knowing that another stamper was going to see my stamp room was just the inspiration I needed to clean up and organize it, as best I could. It's a really tiny room, and I have waaaayyy too much shi, er...stuff crammed in there. I finally had DH install the ribbon organizers I got for a bargain, and I put all the lovely (uncooperative) ribbon away. Just lookie! My stampin' area is just off camera, to the right. It all looks so tidy now, but you can bet as soon as Jennifer leaves, the room will be a shambles again. Anyhoo, I took pictures, so I have proof it was reasonably organized, if only for a brief moment. Everything is in order, including the supply of chocolate, coffee, and wine (and/or margaritas)! Let the stamping begin!!! thanks for calling me....LOLOL j/k Your room looks great! This room is amazing and still reasonable intact! ;-) Thanks for letting me play with your fabulous assortment of SU goodness! What a treat to visit with you and, of course, stamp together! Jealous!!! Would love to play with both of you!